The Puretec SOL Series Water Softening unit is here to protect your entire home from calcium build up and scaling. It will increase the lifetime of your pipework and appliances and it works to protect them against all the nasties found in our water. The Puretec SOL Series Water Softening unit is reliable, durable, simple to use and almost maintenance free! With the SOL Series water softening system you will notice your soap and shampoos lathering better, your skin will be less dry and soap scum reduced! 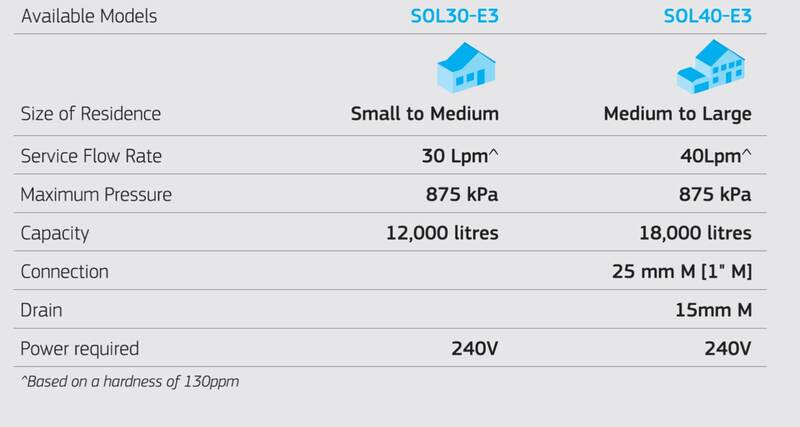 These SOL-E3 Series Systems will remove the hardness in your water to reduce build-up an scaling. The water will provide a better lather when using soap and shampoo to help cleaning. Hot water appliances will last longer and your clothes will be softer! Reliable, Durable and Almost Maintenance Free! The Puretec SOL-E3 Series uses an E3-MaticTM Valve, this is the most advanced water softener valve. If water is not being used it will not back-wash, when it does back-wash it will be at a time when you never use water so that you will be able to use water when you need it. Using very little power and only needing minor maintenance every 2-4 months (depending on your water supply) this unit is ideal for all households. Just add simple inputs such as the water hardness, time and date and the unit automatically calculates the capacity before it automatically initiates a regeneration through a back-wash.
3 Year Platinum Protection applies to Puretec Systems when used in conjunction with a Puretec filter cartridge. Warranty excludes cartridges.